Barton Gellman in The Washington Post, December 23, 2013. It’s been a little over a year since revelations from Edward Snowden’s historic NSA leak started appearing in newspapers around the world, and information about new surveillance programs is still surfacing every month. Last week, The Washington Post analyzed 160,000 NSA records and found that “ordinary Internet users, American and non-American alike, far outnumber legally targeted foreigners in the communications intercepted” by NSA surveillance programs. Four days later, Glenn Greenwald released the names of five distinguished Muslim-American men whose emails were being monitored by the NSA, none of whom are suspected of any wrongdoing. Here’s a roundup of the five (previously) top-secret NSA surveillance programs that you should know about. Journalists had already known about NSA efforts to collect internet and phone data for nearly a decade. 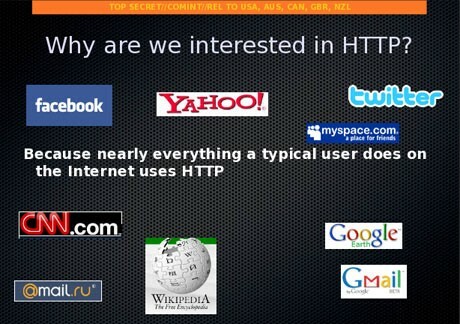 By 2007, the NSA was adding one to two billion internet records to its databases daily. In 2010, The Washington Post reported that “every day, collection systems at the [NSA] intercept and store 1.7 billion emails, phone calls and other types of communications.” What we didn’t know was whose communications were being stored, and what ability NSA analysts had to access them. When Snowden revealed the stunning power he had as a contractor for the NSA, he was referring to the NSA’s XKeyscore program — a program previously unknown to the public — which gives analysts the ability to easily search through the staggering amount of internet data collected and stored by the NSA every day. 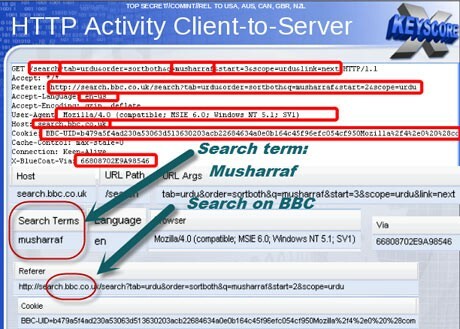 Want to know who searched for Pakistani President Musharraf on the BBC’s website? 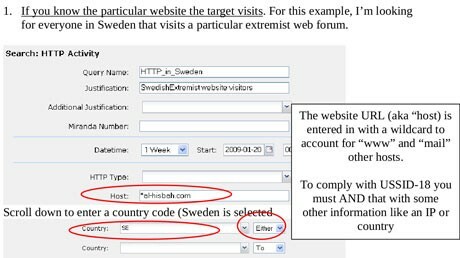 How about “everyone in Sweden that visits a particular web forum”? FASCIA is the NSA’s real-life Marauder’s Map. In December 2013, Barton Gellman and Ashkan Soltani of The Washington Post reported that FASCIA was collecting nearly 5 billion pieces of location data from hundreds of millions of cellphones worldwide every day. For your cell phone to work, your service provider needs to know its approximate location. Your phone transmits this information to the nearest cell towers, which the network can then use to triangulate your location. According to leaked NSA documents, FASCIA works by storing this location data when it is passed along the cables that connect different mobile networks. An NSA analyst sitting at a desk in Maryland can then search through this stored data to track the location of a specific phone user. 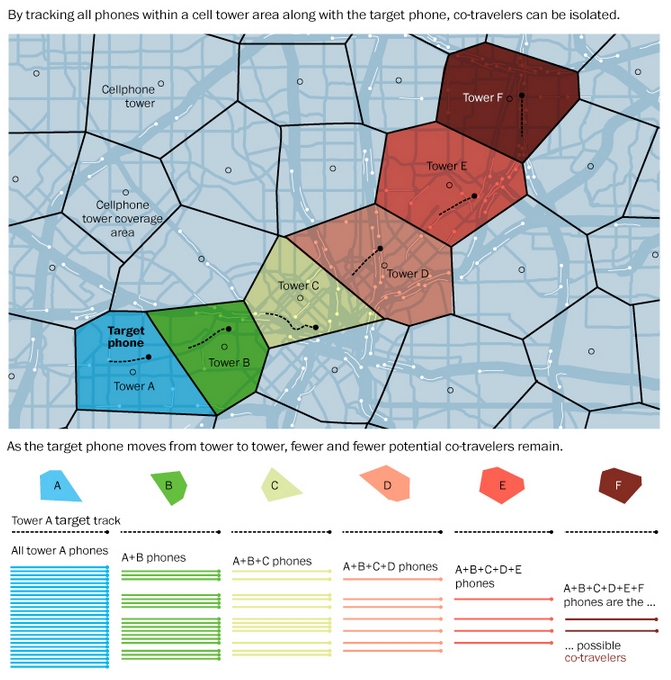 Perhaps the most interesting (and scariest) functionality of FASCIA is its “Co-Traveler Analytics.” By comparing a known target’s cell phone location with the location of other cell phones during an hour-long time window, the NSA can isolate groups of cell phones traveling together to find associates of the known target. Think TSA full-body scanners are intrusive? 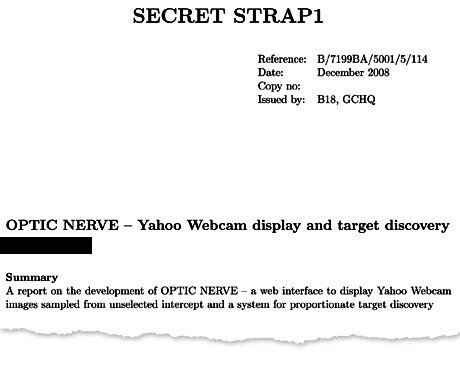 The UK’s surveillance agency GCHQ collaborated with the NSA to create Optic Nerve, a program that automatically stores webcam images of users chatting on Yahoo Messenger. During one six-month period in 2008, Optic Nerve collected images from 1.8 million Yahoo accounts. It inserts each image, even those without a known target, into NSA databases, which can then be searched by analysts using XKeyscore. Again, all this happens without a court warrant. Yahoo denied any knowledge of Optic Nerve, calling it “a whole new level of violation of our users’ privacy,” and promised to start to encrypt all Yahoo services by April 2014. As of today, Yahoo Messenger remains unencrypted. Boundless Informant, besides having a unenviably unsubtle name for NSA officials to have to explain front of Congress, is perhaps the most damning evidence so far that the NSA is conducting mass surveillance inside the United States. The top surveilled countries in 2013 were Iran, Pakistan, Jordan, Egypt and India. Image from The Guardian. The map above shows that in March 2013 alone, the NSA collected over 73 billion metadata records worldwide. Despite the NSA’s assurance that it does not intentionally collect data on Americans, nearly 3 billion pieces of metadata were collected from the United States alone. If you want to see what your own metadata looks like, engineers at the MIT media lab developed a program called Immersion that analyzes your email metadata to create a cluster chart of your social connections. Like FASCIA, Dishfire targets cell phones. More specifically, it collects nearly 200 million text messages daily around the world, using them to view financial transactions, monitor border crossings, and meetings between unsavory characters. Using Dishfire, the NSA can extract names, geocoordinates, missed calls, SIM card changes, roaming information, travel, financial transactions, and passwords from a user’s cell phone. The NSA has stated that they removes all text messages involving U.S. citizens from their databases, and that “privacy protections for U.S. persons exist across the entire process concerning the use, handling, retention, and dissemination of SMS data in Dishfire.” Based on this week’s Washington Post report that nearly half of NSA surveillance files involve Americans, it’s hard to take their word for it. March 13, 2014 Will We Ever Get Over 9/11?